Closeup of D’Copper casserole pot’s. Hand made and hand painted by artisans in Santa Clara del Cobre. When Andrea Paz Vargas arrived in the Bay Area almost 10 years ago, she worked three different jobs with one objective in mind: to open her own arts-and-crafts copper store. She had this in mind when she accompanied her grandmother and aunt to a Quinceañera party in Yuba City. On the last day of their stay, she surprised them with the news: she wasn’t going back home to Mexico. “My dad had got me a ticket so I could take care of them during the trip,” she said. 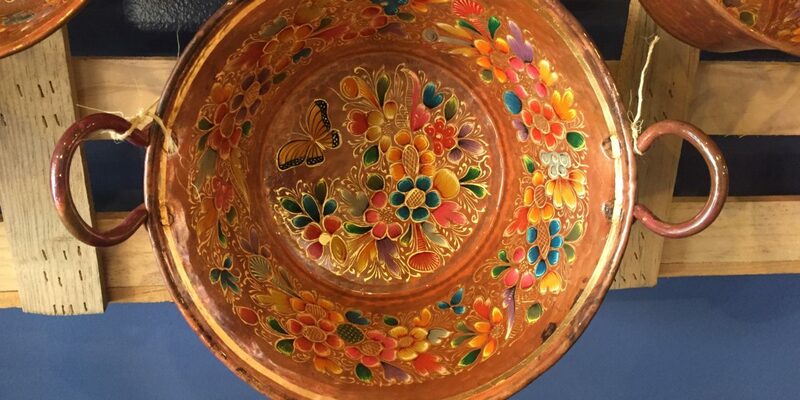 Instead, she left home — the Mecca of Mexican copper design — to go into the family business of coppersmithing. It didn’t really matter that she had no command of English, that she had no seed money, that she didn’t know anyone or that she didn’t know how to navigate the business-permitting process. In the little free time she had, Paz Vargas would go to traditional Mexican arts-and-crafts stores and offer her copper products. She would set up a table at local fairs, farmer’s markets and private parties. “People’s response wasn’t so good, because the items I sell are not cheap. For example, a vase can be up to $400. It was hard, because I wasn’t able to explain in my broken English the work and labor it takes to create such a unique piece,” she said. People here were not used to seeing this type of expensive craft in a metal such as copper, or from someone selling it from a stand. “They have a better response now that I have the store (Dcopper Plus at 1017 Valencia). But people don’t like copper because they don’t know how to keep it clean and they think it’s not worth that much. But it’s just like silver — the prices are just going up; it doesn’t matter how dark the metal gets”. Paz Vargas is a copper evangelist. It figures: She hails from a big family that features four generations of copper artisans. In Mexico, her grandfather used to travel and set up shop anywhere he could sell his copper crafts. 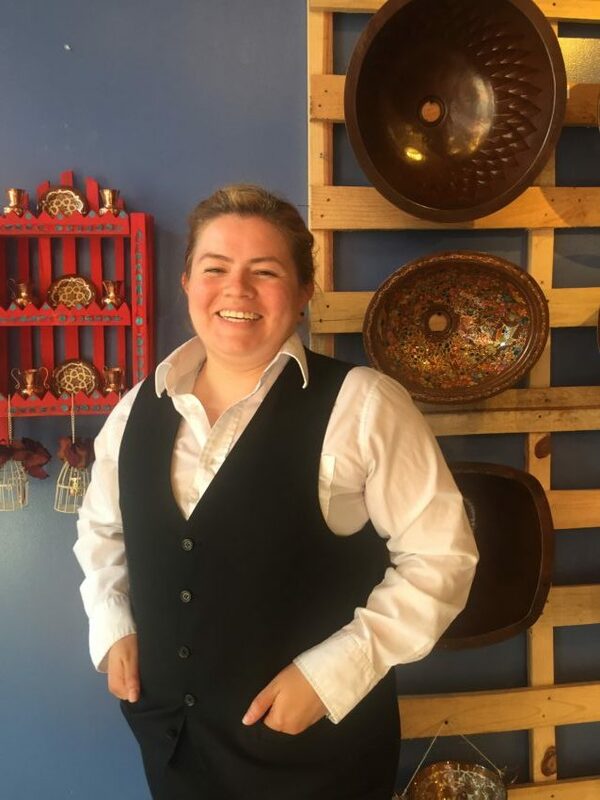 She recalls what it was like growing up in her family’s copper store in Santa Clara del Cobre, in Michoacán, Mexico, where she learned the basics of running a business. Instead of lemonade stands, children here get little copper stands as a way to begin engaging in the family business; 80 percent of the town sells and crafts copper products. “We all have our store next to each other on the same block … This is how we all know how to make a living”. Each family has their own copper forge, store and selling points to spark creativity in styles and methods of crafting all the different copper products. Her grandmother, Felicitas Ornelas, broke the mold by being one of the first women to step into a copper forge and work as a coppersmith. Andrea Paz Vargas. Photo by Andrea Valencia. In Santa Clara del Cobre, women are not celebrated for standing out, says Paz Vargas. For the most part, the town has always followed a type of patriarchy that traces to the times of the Spanish Conquest, when Vasco de Quiroga gave exclusive rights to the natives to produce copper artifacts. Copper was abundant then, and it became the trade of every family that lived in the town. However, in the last 10 years, copper production has declined in Mexico — and, with the violence, tourism has plunged. Nobody is visiting to buy copper goods; her hometown now looks “like a ghost town”, said Paz Vargas. This is why Paz Vargas is committed to spreading the word about where she comes from: so that she can help encourage younger generations of women that live in Santa Clara del Cobre. Back in San Francisco, Paz Vargas was able to find solace and support at Mixcoatl Crafts on 24th Street. One of its owners, Connie Rivera, introduced Paz Vargas to the entrepreneurs’ program ALAS (Alternativas para Latinas en Autosuficiencia). There, Paz Vargas began to put into action her business idea. She graduated from the ALAS workshop in 2013 and began searching for a commercial space. She looked everywhere, but she was hooked on Valencia Street. Any time she saw a space up for lease, she would call to inquire. Paz Vargas was turned down multiple times because she didn’t have a credit record, didn’t have a business history in the United States, and her idea of bringing copper crafts from an old copper town in Mexico didn’t strike people as a reliable venture. These days, Paz Vargas works full time as a parking attendant to keep her store open. She has some bad days when she doesn’t sell anything, and she has some good days when she does. On one weekday, a customer mentioned that he has a copper bathtub in his house, just like the one Andrea has on display by the window. He asks how much it is, trying to gauge if he paid too much, he said. Andrea replies – $4,000. He’s relieved. “Yep, that’s it!,” he said as he left the store. Paz Vargas’s biggest hurdle has been in building a customer base that understands her prices are fair. To do this, Paz Vargas tries to establish a connection with her customers, even if they don’t buy anything. Tuesday through Friday: 12 p.m. to 9 p.m. Correction: a previous version of this story incorrectly stated that Paz Vargas graduated from the ALAS program in 2017, instead of 2013. It has now been corrected.